There’s something about a march. It’s not a parade. It’s a march. People together. Maybe arm in arm, maybe not. But definitely believing in the same principles, and moving forward in the same direction. Does anyone doubt that sense of unity is what our country needs more than ever? So I don’t know why Republican leaders are not at the 50th anniversary of the historic Selma to Montgomery march. I know if I had a congressional plane and VIP accommodations, I wouldn’t be hesitant to commemorate a real milestone in our country’s history of equality. Maybe the Boehners of the world regret all that ever happened. Without 1965 and the Voting Rights Act, there’d probably be even fewer minority voters, let alone minority candidates and office holders today. Indeed, 1965 was a banner year for our democracy and all the things that have made our country great. President Johnson’s War on Poverty began to address economic inequality. Massive changes in immigration laws would lift discriminatory quotas and lay the groundwork for generations of diversity. I guess that’s why some people would rather not remember Selma. Especially if they are the ones leading the reversal, forcing the pendulum to swing the other way. For some, Selma must seem like it was the beginning of the end. 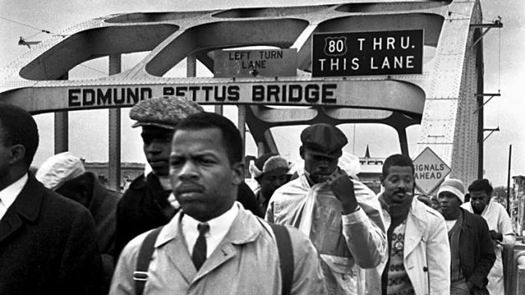 But for people of color, Selma was just the beginning of the hard work needed for a new American future. And, of course, make no mistake, Asian Americans were part of that. But I will defer to the man whom I feel is our community’s official delegate to Selma. Todd Endo was there 50 years ago. In many ways, he was born to be our surrogate at Selma. As a Japanese American who spent the first three years of his life incarcerated in a WWII internment camp, Endo knows a sense of injustice from birth. When I first met him at the March on Washington in 2013, we joined others in replicating the march that began the push for the Civil Rights Act and commemorated Martin Luther King Jr.’s “I Have a Dream” speech. But even then, as we walked by the MLK memorial, Endo was saying, wait for Selma’s 50th anniversary in 2015. That, he said, was the march that changed his life. 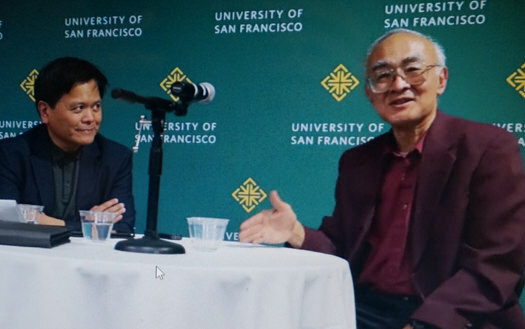 This year, I re-connected with him last month at a special event organized by the University of San Francisco’s Critical Diversity Studies/Asian Pacific American Studies. “Even the Japs are here,” Endo recalled hearing when people saw him at Selma. The epithet was a reminder that Asian Americans in 1965 were still seen as foreigners, and definitely oddities in the South. It enabled him to empathize with what was happening at Selma. But he admitted he did not immediately join in 50 years ago. He was not at the march on the day known as “Bloody Sunday.” He was still in Boston, a history graduate student at Harvard, watching it play out on black and white TV. That’s how he witnessed the beating of John Lewis and the other marchers. Then two days later, on what became known as “Turnaround Tuesday,” it all became a matter of conscience. After that second aborted march at the Edmund Pettus Bridge, later in Selma came the news that the Rev. Jim Reeb was beaten to death. Endo was an acquaintance of Reeb’s in Boston. And that was the moment for him. Endo admitted to being angered. But there was something more. At Selma, there were the marches that made it on TV, and then there were the everyday marches that people were doing long before the cameras showed up. Endo described it as what the real people did for three years before, marching to the courthouse to show a commitment to democracy. Endo said in the movie, “Selma,” he related most to the Oprah Winfrey character, who attempted to register to vote and was constantly denied. Endo saw her as a composite of the many women he saw at Selma. Endo said he was never scared at the march, although he saw the sheriff’s deputies and knew of the violence in the prior marches. He drew strength from the two women he marched with. Endo didn’t recall their names. But he definitely remembered their spirit at Selma. A sense of community as Selma. Todd Endo felt it 50 years ago. He’s back there today to feel it again. 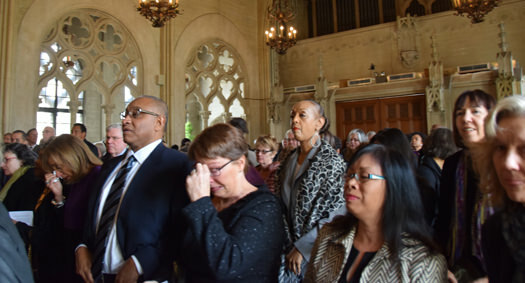 I have to admit, I felt that community feeling earlier this week when I attended a memorial service for my friend Dori Maynard. Maynard was the president of the Robert C. Maynard Institute for Journalism Education, which advocates for diversity in employment and coverage of people of color in all media. She died of lung cancer last month. What amazed me was how her service drew people from nearly 40 years of my life in American journalism. It was like a mini-civil rights confab, and as diverse a crowd as you’ll ever see in 2015. There were blacks, whites, Latinos, and Asian Americans. All together at an interfaith serv ice of 200 people from intermarriages, mixed race kids. It had the look of the real America. And there were many people from the media. I also saw longtime friends and colleagues, such as Jon Funabiki, longtime reporter, now a journalism professor; Evelyn Hsu, former Washington Post reporter, now program director at the Maynard Institute; Valerie Chow Bush, former Asian American Journalists Association executive director; Lisa Chung, also a former AAJA executive director, as well as a former columnist with the _San Jose Mercury News _and the San Francisco Chronicle. Chung lamented the loss of Dori, who was bi-racial and was a magnet that brought all different folks together. But her real lament was for the fate of the news business without constant prodding by Dori and the institute. Chung was sensing what maybe we’ve all felt the last decade or so–the rising inequality in all aspects of American life. And our quiet acceptance of it. It made me see Dori’s service as my Selma. For me, this was about the civil rights battle in my own profession, the media. I may have been a child in 1965, wondering how to keep a ground ball from hitting me in the face while playing third base. But the world around me was changing to create the line drives I would later face as an adult. Just as life today is being transformed digitally and creating disruption in all industries, including the media, Selma and 1965 were the start of another very basic and real disruption in society. Institutions that were all-white were forced to be less so in employment and news coverage. But in the media, it was not so easy as flipping a switch. 1965? So why was it only in 1989 that an Asian American first became a host of NPR’s “All Things Considered”? I know how it happened. Because that Asian American host was me. All the memories, seeing the faces of those at the service as the once and future diverse newsroom, underscored the continuing importance of the Maynard Institute’s work. And the continuing fight for justice in all aspects of our society. The battle against stereotypes and for inclusion is still our great fight in America and in all its institutions. 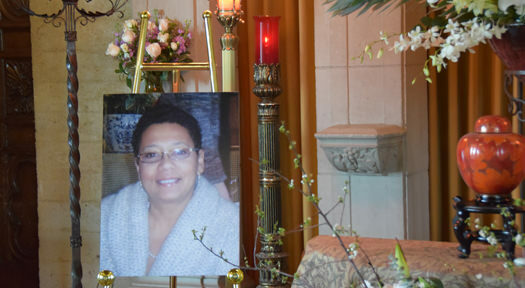 Dori’s service was proof to me that you don’t have to be at Selma to feel Selma. Selma is everywhere. We have to make it happen wherever we are. All it takes is marching together, in the same direction.